Lucy Barret is a web developer with a hands-on experience in developing front-end for websites. Currently, she is working at HireWPGeeks Ltd. – a leading WordPress Development company. Lucy is also a passionate blogger and loves to write technical content on various topics. Everything in a WordPress site is powered by a database. It’s the engine room that is constantly making sure that the right content and media is served up to your visitors when they come to your website. That makes it an incredibly important part of your website. You may be asking what a database is exactly? A database is a structured and well-organized software which is used to store data permanently. When it comes to WordPress, it traditionally uses MySQL as its database management system and is built using the PHP scripting language. Hosting companies may provide MySQL databases in their hosting packages to operate websites that require a database. To operate WordPress websites smoothly and troubleshoot problems, it can help if you have at least the basic understanding of PHP and MySQL. When visitors browse your website, they make a request, which is sent to the host server. The PHP programming language receives the request, processes it and then forwards the request to the MySQL database if it needs to retrieve data from the database. The database finds the requested information and then sends the data back to the PHP script to handle it as per the script’s coding. When you operate your WordPress website, its database stores a lot of information, such as unnecessary tables, data, drafts, spam comments, login details, etc. A large database can affect your site loading speed and may hurt its overall performance. Therefore, you need to clean and optimize your WordPress database at regular intervals to improve the performance of your website. 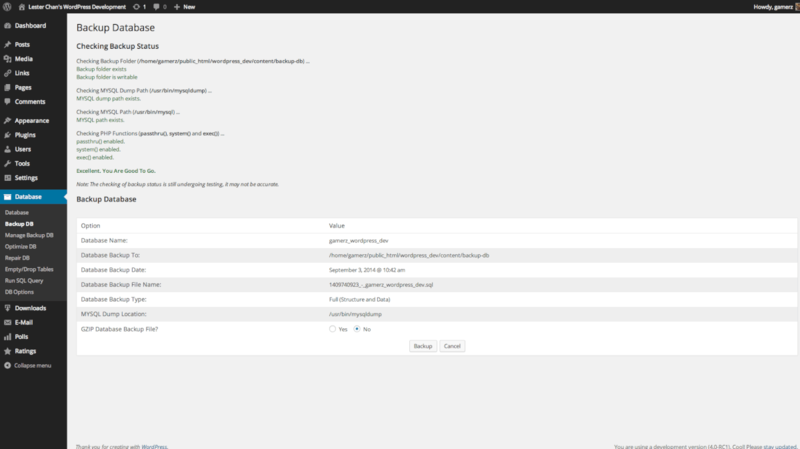 WordPress users can use phpMyAdmin to manage a WordPress database. PhpMyAdmin is an open-source tool, which offers a web-based graphical user interface, allowing you to manage your database easily without a large amount of knowledge in programming. Scroll down and click on the database option. You will get a list of databases that you have access to. Select the database that holds your WordPress website data. WordPress has 11 default tables for you that may include wp_comments, wp_links, wp_term_taxonomy, etc. You can choose any one of them depending on your specific needs. You can go for the “Check All” option to select all of your tables for optimization. Based on your needs, you can perform a number of actions such as adding new admins, finding and replacing/changing words in a post, repairing/optimizing your database, changing passwords, deactivating plugins, etc. It is worth noting that you can’t undo the changes you have made. Therefore, it is advised that you should create a backup of the database before making any changes. This will help you to avoid any loss/damage as a result of database optimization. When you optimize the tables in this way, it will help you to trim the size of your site’s database. This will help to make your website run faster and may impact your website positively in terms of SEO. 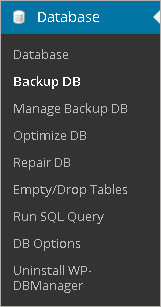 Take the backup of your website by clicking on the “Backup DB” in database option. If you want to download the database, click on the backup option. Similarly, to optimize the database, click on the ‘Optimize DB’ option. The plugin will automatically optimize the WordPress database once every month. Based on your needs, you can schedule for database maintenance as well. If you want to clean the database, choose the Empty/Drop Tables option. You may ask your hosting company to backup your website. However, you need to be careful with this option as there are only a few hosting providers who genuinely take backups of your site. Even if they do genuinely take a backup of your site, you can’t fully rely on these backups when you face unexpected issues with your websites. Tables may be missing or the company may not take a backup in such a way to allow for easy recovery. Click on your WordPress database name to select it under phpMyAdmin. Click on the export link. WordPress will ask you to choose the export method. Select the custom method for searching more options. Scroll down and go to the output section. 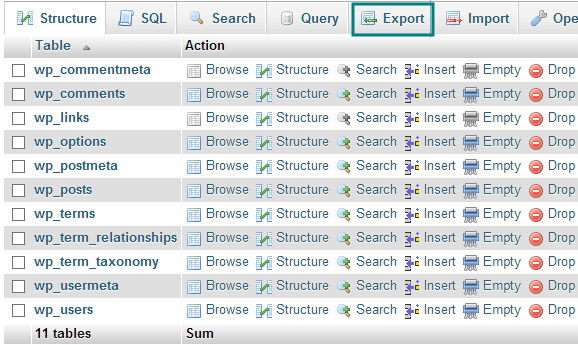 PhpMyAdmin automatically shows the output of the export process. Just change that by choosing ‘Save output to a file’ option. Choose zipped or gzipped option to compress the downloadable files. Now, go down and click on the ‘Go’ button. Your browser will start downloading the copy of the database in zip or gzip file. Go to the backup page → partial backups section → choose the database and download your database backup file. If the above-mentioned methods are too difficult for you, then you can use WordPress plugins to backup your website and database automatically. It will help you a lot during catastrophic situations when your website is hacked, or you make serious mistakes while operating your website. How to increase Database Security? There are several ways to ensure the security of your site’s database. Use unpredictable and complicated usernames and passwords. You may use security plugins to protect your website from unauthorized access and various online attacks. DEFINE(‘WP_ALLOW_REPAIR’, true) in your wp-config.php will also help you to avoid some database issues by allowing WordPress to automatically repair the database where it can. Data management in WordPress is part and parcel of any WordPress site manager’s day to day life. Everything in your WordPress website is powered by the database and so it’s really important to make sure your WordPress site’s database is working as well as it can. With the help of easy to use tools and processes, you can make managing the database a much easier task for yourself.